Panathinaikos have urged their fans to protest against the "totally wrong and inexplicable decision" to call off their Athens derby against Olympiakos for crowd trouble. 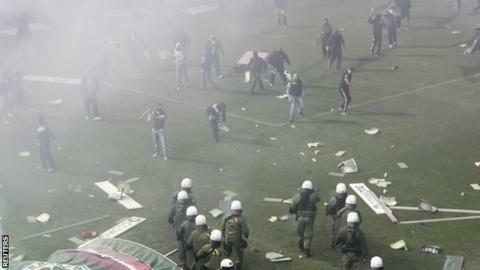 Kick-off was delayed, and then cancelled, as Panathinaikos fans threw flares onto the pitch. Supporters invaded the pitch and fought with riot police inside the stadium and on the streets. The club considered quitting the league in protest, but decided against it. In a statement, the board condemned the violence and throwing of flares, but also blamed the referee. "The totally wrong and inexplicable decision of Andreas Pappas to postpone the start of the game led the board to the unanimous decision to send a call to the club's fans to make a peaceful rally on Wednesday at 4pm outside our historic stadium with the motto: WE CAN'T TAKE ANYMORE! "Our wish is to protest the situation in Greek football and for the failure of the state to address the phenomena of lawlessness." Olympiakos did not have any fans at the ground, as away supporters are banned in the Greek top flight.